We are proud to announce that Margie A.S. Lehrman of our firm has been selected as Executive Director of The American Craft Spirits Association. The current plan is that Margie will continue to work on select beverage licensing matters, on the local level in DC, Maryland and Virginia, to the extent her ACSA schedule allows. Of course we will build in protections against any conflict of interest or potential conflict of interest, and we do not expect Margie to be involved in any matters adverse to any spirits companies. In many ways, her new position is the result of a divine coincidence. A few months back I went to the ACSA convention in Austin, Texas. I asked Margie to come along, as a spouse, because I thought the drinking, dining and music would be a lot more fun with a spouse along. Midway through the convention, Nicole Austin announced that ACSA was on the lookout for an E.D. to replace Penn Jensen. As a joke, I told Margie I was going to nominate her. When Nicole finished her speech, I made a beeline for Tito and the other powers that be within the association. I said Margie would be perfect, due to her 20 years of high level trade association experience, and her many years of law practice and beverage law experience. I didn’t really expect it to fall into place so smoothly. Twenty minutes later she was deep in conversation with Penn. We wish Margie and ACSA much continued success. 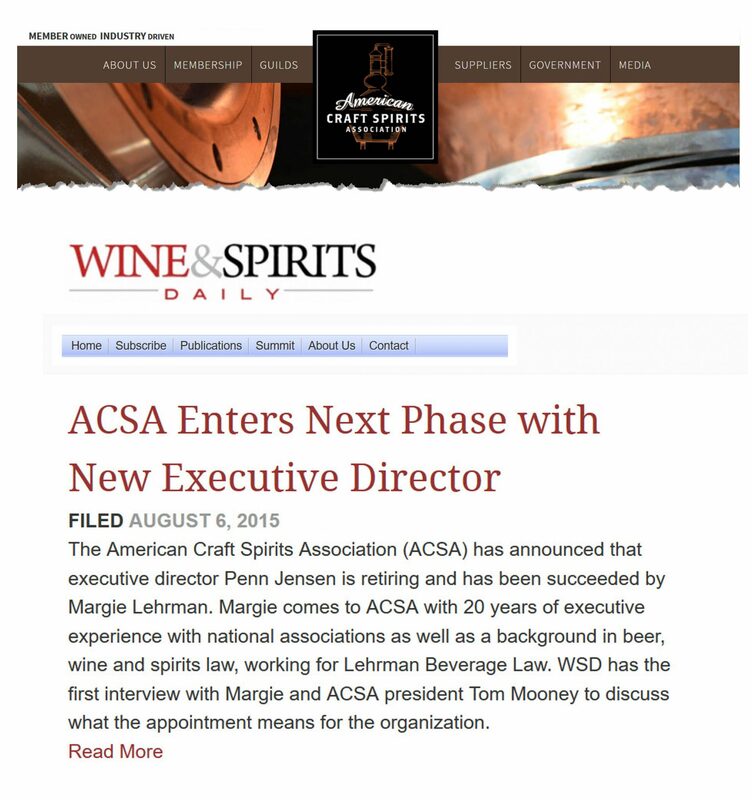 My illustrious wife can be reached at ACSA at margie@americancraftspirits.org, or at the law firm at margie.lehrman@bevlaw.com. The full press release from ACSA is here.